When was the last time you ate five large carrots in one sitting? Probably never unless you’re a juicer! Carrots are packed with vitamins, minerals, antioxidants and phytonutrients. They also are a good source of fiber, starch and natural sugars which make them great for boosting your energy, so be sure to include them in your daily juicing lineup to reap their countless benefits. Carrots can help to lower your cholesterol, lower your risk for heart disease, help maintain good eye health, help clear up acne, and even smooth your skin and fight the signs of aging. Sign me up! This juice is perfect to jump start your day. The carrots, kale and spinach offer a triple threat of Vitamin A, which is key for good vision, a healthy immune system, and healthy cell growth. The beta-carotene found in carrots is a natural antioxidant and can help lower the risk of heart disease and cancer. The kale and spinach also provides cancer-preventing properties. Even with the bitter taste of the dark green veggies, the carrots and lemon sweeten it up, which make it taste great! Wash and prep your veggies and fruit. Start with your dark green leafy vegetables (spinach and kale) and place into your juicer. Next put the carrots and cucumber through, and finish with the lemon. This juice tastes surprisingly mild with the natural sweetness from the parsnip and carrots, and will help fight off cold and flu germs naturally with all of the Vitamin A in the carrots, and the Vitamin C from the orange. Onions and garlic contain allicin, which has the ability to slow and kill a variety of viruses and bacteria. Feed the carrots, onion, garlic, parsnip and then the orange through your juicer. Stir in the ground turmeric, black pepper and water and then pour over ice and enjoy! The combination of the sweet carrots and the fragrant passion fruit seeds, along with the ginger, creates a luxurious flavor with just the right amount of zing from the ginger root. Passion fruit seeds have numerous cardiovascular benefits and also have magnesium, which is necessary for strong bones among many other health benefits. Feed the carrots, then the passion fruit seeds, followed by the ginger root and then the apples. Pour over ice and enjoy the tangy goodness. This pairing of carrots, sweet potato, and peaches with the punch from the ginger creates a juice that will put a smile on your face for sure and keep your energy levels up. Sweet potatoes are high in Vitamin B6, Vitamin C, Vitamin D, and iron. Iron provides our bodies with adequate energy as well as the production of white and red blood cells. Feed the sweet potato, ginger root, carrots and then finally the peaches through your juicer and serve over ice. This simple juice recipe will keep you hydrated and cool in the hot summer months, and the sweet taste balanced with the zip of ginger will have you asking for more. It’s the perfect poolside beverage to quench your thirst and the long laundry list of ginger benefits makes it worth it to make this juice again and again. Ginger can aid in digestion and is a natural anti-inflammatory, and has an anti-tumor effect on cells. Feed the carrots, then the pineapple and finish with the ginger root. Say goodbye to your acne and smooth your skin with this simple and yummy juice. Kick the chemical filled dermatological products to the curb and go au natural with this juice packed with Vitamin A, which is a key ingredient of some topical acne remedies, known as retinoids. Feed the carrots, spinach, celery and finish with the lemon through your juicer. Serve over ice and say goodbye to your acne! Another summer favorite, this juice is sweet and refreshing, but the fresh taste of the parsley rounds out the juice nicely. Bromelain, which is a natural anti-oxidant found in pineapple juice, acts an anti-inflammatory and digestive aid. Feed the celery, carrots, ginger root, cucumber, pineapple, beet and finally the parsley through your juicer. 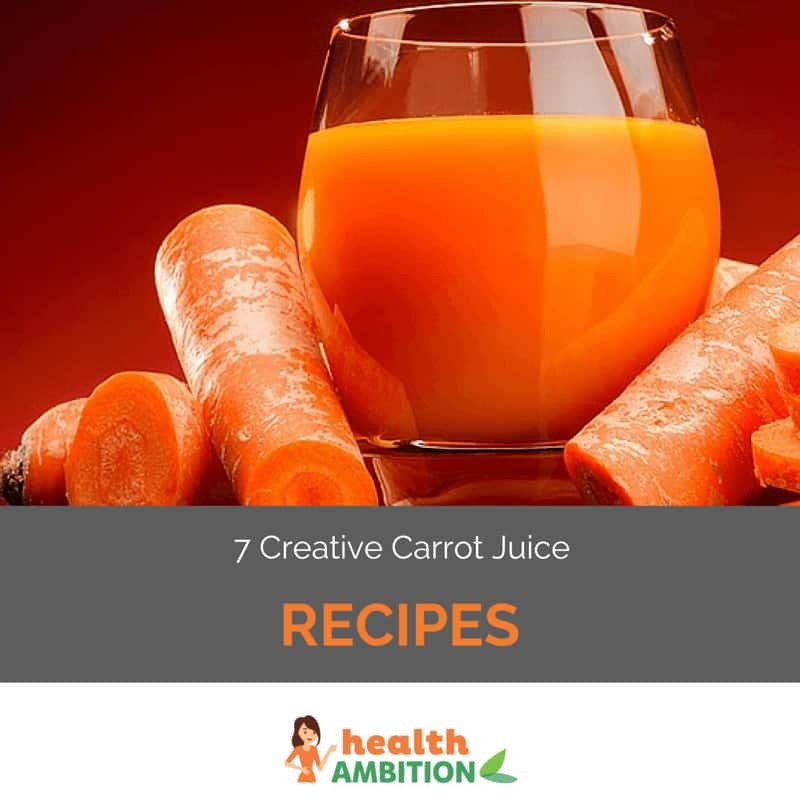 So, if you’re like me and don’t love cooked carrots on your plate, grab a tall glass of carrot juice and reap the numerous health and beauty benefits they provide with all of these delicious and nutritious combinations. My personal favorite carrot juice is the Morning Energizer. This is one of my go-to juices because I enjoy the taste and am able to get in all of these vital vitamins and minerals in just one large glass of juice. Kale is not a vegetable I cook often so I want to make sure I get it into my diet and the Morning Energizer juice ensures that I do! Which carrot juice combination from this post do you enjoy the most? Please share yours in the comments below!